You have just chosen the University of Lincoln as your firm choice for September; you are currently working hard to get the grades you deserve in August yet worrying about the endless preparations for student life. Please do not worry about making friends! This was definitely one of my biggest fears before coming to university – will anyone like me? I’m too shy, how will I be able to make friends? The countless questions you torture yourself with go on… However, making friends is one of the most natural things when you first move to university. You’ve probably heard this phrase a million times but everyone really is in the same boat. Everyone is extremely friendly and making conversation is never hard, especially when you’ve just met someone for the first time. Also, there are so many opportunities to make friends – your flatmates, course mates, people you meet on fresher’s week on nights out, someone in a society or even colleagues if you’re looking to get a part-time job. As you can see, there are so many situations where you can find someone will similar interests to you. Don’t panic! Moving into halls is the first major hurdle when coming to university in September. Emotions are running high – nerves start kicking in as you drive to your temporary home, sadness lurking as you kiss your family goodbye but most of all, you are probably excited! I was so excited to meet my flatmates, socialise with new people and make fresher’s a week to remember! My number one tip for moving into halls would be to NOT dwell in your room. If you sit on your own long enough then you will start to overthink – open up your door and invite a flatmate in to have a chat, get to know each other and you will forget the loneliness you felt five minutes ago. Also, I’d definitely recommend getting to halls early to claim the best fridge and cupboard spaces! Fresher’s week is filled with a variety of events for both alcohol lovers and for those who prefer not to drink. You don’t have to feel peer pressured to drink – there are so many different things to do that don’t involve alcohol. My favourite part of fresher’s week at the University of Lincoln was the infamous fresher’s fayre. 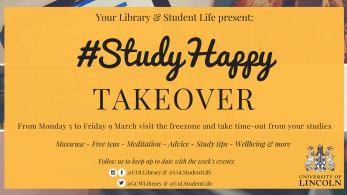 Here you will receive SO many free items including stationery and food; take advantage of the free vouchers that people will be handing you left right and centre. Not only will you get a free Domino’s pizza but you will save SO much money by utilising the vouchers you gain. Don’t let them go to waste! Conclusively, there are so many things running through new student’s heads prior to moving to university. I know how stressful it is trying to get a list of everything you need together along with all the worries of university life and adulthood. Enjoy your first week at university and absorb the crazy new atmosphere that is your life. Don’t panic, you’ve got this!